The “wipe-out-method”, ( Bistre Method.) with the layered approach. I start the image by covering the white canvas with an overall thinned mix of brown made from umbers, almost a sepia tone. I lift out areas to build lights, and add more brown for the darker tones. The lightest lights are the white of the canvas instead of white pigment. I begin simply stating the pattern of light and dark, and editing them by wiping out and adding pigment back in as I refine my underpainting. Once I have my basic structure and design stated, I can proceed with a number of methods. You can have underdrawings that range from summary sketches to highly finished compositions. I could continue refining the underpainting with more browns, or move to more opaque paints of white and grey (Grisaille) developing a full monochrome underpainting for later glazes. Or work directly on top of this with full color. My intent is to incorporate a little of all these indirect painting methods in this image. But the majority of this image will be done in a layer method. When working in the layered method, a great deal of alterations (color modification and redrawing) can be done throughout the painting, and uniquely, one can easily incorporate different effects with transparent, semi transparent (glazing and scumbling) as well as opaque paints. I refine the background with more opaque paint, keeping the edges soft and atmospheric. I begin to thinly model the darkest areas of the bottle to help better judge the lighter translucent parts of the bottle. I restate the petals with flake white. I want them read as a solid surface and later to have some texture. I concentrate on bringing as much finish to an area as I can, relating one area to another, working the image as a whole, looking for more accuracy in shapes and color notes. In each layer I bring the image a little more into focus, reexamining and correcting problems as I zero in on the finish I want. That may sound contradictory, but the goal is to accomplish as much as one can at each sitting and paint layer, yet bring the image together as a whole. The Wood Poppy, I work-up with color and some thicker impasto strokes, the stem and leaves get a glaze of greens with some opaque highlights. 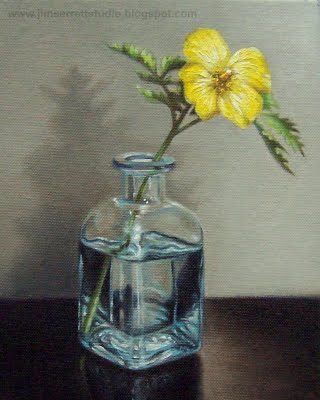 Finished Image: Wood Poppy - 8”x10” - Oil on panel. I continue working the image with layers by bringing areas into fuller focus. Keeping in mind lost and found edges, where do I want things to be a bit softer (blurred), and harder (sharper). The pedals get some heavy sculpted brush strokes, and the bottle receives some glazes to unify areas and soften others. I build up paint in the highlights with some impasto strokes. I’m pretty happy with the piece at this point and I think I’ve answered most of the visual problems set before me and will probably consider it finish. However I really like to set a work aside for several days and look at it with a fresh eye before it gets the finishing signature. For a visual explanation of this process click the video below. The layered method really requires the painting to dry between layers and sittings. So a fast dry medium works best, I used Maroger Painting Medium in this work. But there are many other medium choices, 1to-1to-5 of linseed, dammar and turps will work just fine. Just work thin to thick, lean to fat and when using mediums, less is more. In all of these underpainting exercises I chose to use flowers in a small format. Keep in mind, if using perishable items such as these you will need a good drawing reference or a resource to replace the flower, lucky for me Linda’s passion for gardening is a endless resource. Also I am not attempting to produce floral for a botanist field guide, and I am just attempting color, shade and shape in the hopes of an illusion of reality with a spark of color. Closing Thoughts, ... yes there is more … on technique, Titian and artist's today. My original intent was to explore the technique of the Master Titian, his method of underpainting and building a painting. I have come to the realization that no single approach truly reflects this master, and that all the methods I have been exploring including this demonstration were employed and exploited to achieve his unique versatility. Titian certainly used the underpainting methods of the Flemish and Venetian schools, but also had approaches similar to that of the French Academic tradition. He would work directly from life on the canvas, often described as attacking it with a brush. In his underpainting he would use tonal painting in warm earth tones, and use a scale of cool grays for flesh tones. Some areas such as the figure would be highly model into a grisaille, and others simply stated in umber. Painting on to it with a semi transparent paint “velatura” in a layered method, making revisions, with new layers and glazes, building textures and surface with “frottage”, sort of a dry brush of pigment over dried layers and finishing with high impasto for his highlights. Certainly very innovative in his painting approach, but keep in mind, Titian would live a long and productive life. Living to be nearly 90 years old, in some pretty inhospitable times, his life would span and compete with some of the greatest artists in world history. It must be comparable to being there when the first human invented the wheel. He was very inventive and fearless in his approach, seeming to have very little restrictions in his method, pulling from his tool box that which fit best to the problem and imagery at hand. The artist Jose Parramon referred to Titian as the “founder of modern painting”. A statement I must agree with, for Titian certainly was testing the limits of his medium and thinking outside the box in some very revolutionary ways. His mastery of techniques and procedures is definitely worth study, centuries of paintings and knowledge for us to copy and enjoy, the Master’s obvious gift to the world. But it is not just the technical virtuosity we should emulate. These artists were on a quest of discovery, to describe the mysteries and beauty of nature. Through that inquisitive thinking, they made great contributions to our artistic vocabulary. They were not just practicing technical gymnastics, but deeply concentrating on the act of painting and the artistic dialogue with the principles of nature. An Old Master such as Titian painted with intellect, curiosity, and passion. This is what artists today need and must be imitating. a beautiful demonstration with a thoughtful narrative. A great lesson and a beautiful painting! Thank you.